Hi all. I usually try to share photos of our home when it's in tip-top shape. But while my little man was playing today, I thought I'd show how our home really looks...with kids. Plus, I recently picked up some GREAT pieces at Goodwill and wanted to share. This brass and glass shelf was shouting my name at Goodwill. A man had willed all of his furniture to Goodwill, and this was one of his pieces. It's so high quality. I love it. I'm not finished styling all the shelves yet, but it will happen in time. See Spider-man? He's working hard, playing with toys. I'm still happy with the painted Pottery Barn Kids Activity Table. I would love to get a real coffee table but this stores so many toys that I'm just not willing to put it in the basement, yet. This is the full view of chaos! In other news, I found some ah-mazing fabric to reupholster our yellow sofa. I can't wait to share it with you. It's an outdoor fabric that won't fade from the window and won't stain from the boys. Stay tuned! I've had a few people ask me how these glass globe pendants survive with two boys in the house. Honestly, they don't even notice them. They have never been a problem. This teal chair was another Goodwill find. I couldn't believe it was in such good condition! 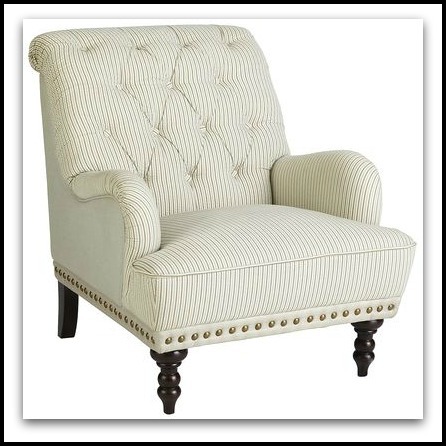 I loved the lines of the chair and the nailhead trim. Last week, I left the house specifically in search of two tall, vintage looking mirrors. As soon as I walked into my favorite resale shop, there they were, 50% off, just waiting for me to take them home! I sprayed them silver and used a gold leaf pen to highlight all the edges. They are hung and looking great. I'll share the big picture once I get the drapes installed. If you missed my plans for our bedroom you can click here. I hope your eyes aren't burning from the chaos in our living room! Does that scene look familiar? Have you found anything great at your Goodwill? I NEVER find just what I'm looking for when I leave the house on a hunt--lucky you!! Love your finds. I posted about etageres today--funny. And that chaos is hardly chaos. My office/playroom is (always) the pits. You know I am coming to steal your brass shelf, just warning ya. ;) Love all your finds, I havea chair in green just like your blue chair you found, although mine is leather. Looking forward to seeing your fabric choice for the sofa! Wow you are a goodwill finding machine! I never can find deals when I am looking for them. Everything is coming together! It looks great! Can't wait to see the new sofa color. You are the luckiest at goodwill. wow- you have definitely scored some amazing pieces! My goodwill visits have never even come close! Wonderful finds, Abby! And I'm a little sad to see the yellow go on the sofa. I love it! Ok- I need to make a trip to my goodwill- now! Amazing finds. :) I absolutely love the brass shelves. Wow - your brass shelf was a great find! !